The Second Judicial District Commission on Judicial Performance, on a vote of 10-0, unanimously recommends that Judge Laurie A. Clark BE RETAINED. Governor John Hickenlooper appointed Judge Clark to the Denver Juvenile Court in November 2013. 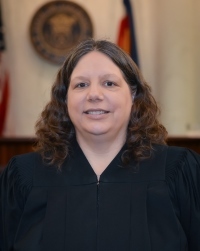 Before her appointment, Judge Clark served for two years as a magistrate judge in Colorado’s Seventeenth Judicial District in Adams County. Previously, as an attorney in private practice, she specialized in juvenile and domestic law for 7 years, representing clients, and serving as a guardian ad litem, child legal representative, parenting coordinator/decision maker, and child and family investigator. Judge Clark helped develop the curriculum for and taught a 40-hour child and family investigator training. Judge Clark teaches courses in juvenile, family, and advanced family law as an adjunct professor at the University of Denver Sturm College of Law, where she earned her law degree in 2004. She holds an undergraduate college degree from Metropolitan State University. Judge Clark regularly volunteers to judge high school, college, and law school mock trial competitions and presents at continuing legal education seminars. The Commission conducted a personal interview with Judge Clark, reviewed opinions she authored, observed her in court, and reviewed comments received from interested parties during the evaluation, reviewed her self-evaluation, and survey responses from attorneys and non-attorneys who had experience with Judge Clark. Of those few attorneys completing the survey, 74% recommended retaining and 24% not to retain. Of non-attorneys completing the survey, 53% recommended to retain, 30% not to retain, and 18% made no recommendation regarding retention. (These percentages may not total 100% due to rounding.) Unfortunately, as with other Denver Juvenile Court judges, low participation in the surveys is a problem; only 9 attorneys and 17 non-attorneys responded. Judge Clark presides over a division of the Denver Juvenile Court. The limited survey results reflect overall confidence from appellate judges and attorneys. Non-attorneys scored Judge Clark a bit lower than the average district court judge. The Commission is not alarmed with the lower scores from non-attorneys since Denver stands alone with having an independent juvenile court and the non-attorney assessments do not reflect any jurors as they do with other district court judges. During her interview, Judge Clark acknowledged the survey results and indicated several positive steps she has taken to address any perceived deficiencies. And commissioners noted that during courtroom observations that Judge Clark appears to have developed a system to ensure all parties are heard in an efficient and fair manner. Given her strengths, the Commission is confident in recommending the voters retain Judge Clark.